As we start building up to the match of the season in Kiev in a week's time, we look at s few privileged individuals to have donned the storied red shirt of Liverpool as well as that the legendary white of Real Madrid. What a resume to have that boasts of two of the biggest clubs in European football, destined to clash again in the final of the Champions League. The biggest prize in the game on the line and two of the most talented squads in world football at the moment, the night in Kiev promises to be one we'll remember for sometime to come. 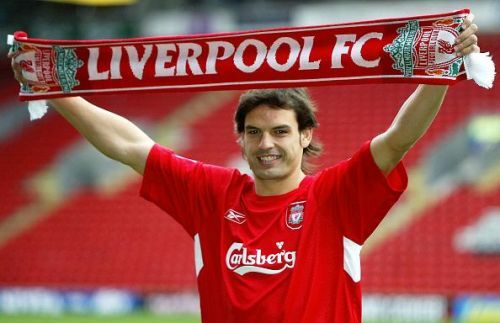 Morientes first made his mark in Spain before taking his talents to Merseyside. The Spaniard was a prolific goal-scorer at Real Madrid, netting an impressive 72 goals in 182 league games. Unfortunately, the Spaniard was unable to keep his place in the side after being ousted from the starting line-up by arrival of a certain Portuguese in 2002. Real Madrid then acquired Liverpool goal-machine Michael Owen, which saw Morientes leave the club to fill the void left by the Englishman at Anfield. Despite all his undeniable talents, he never managed to replicate the same form he showed in the white of Real Madrid and produced a measly eight goals in 41 Premier League appearances.